I sit outside in the perfectly still day. Again listening to the bird calls and bees, but now with a leaden heart. Mischief is on the last few steps of her journey. She had refused to come in for two days, staying outside last night, even in the rain. This morning she appeared at the door sodden and wobbling on her too-weak legs. I wrapped her in a towel and held her close, thanking her for coming back to say goodbye. I had been prepared to let her find a place outside to be alone in her final moments. It is so painful to see her failing, but still better (for me) to be able to be with her. I thought about taking her to the vet, to “assist” the transition. But… I doubt she would survive the anxieties of the trip. But… more so, I find myself wondering. I’ve always thought I was a proponent of compassionate euthanasia. Now I wonder. This transition from life to not life is so profound. And the struggle against it so strong, is there not something there we are meant to understand? And at the same moment I’m filled with terrible awe at the fact the we, across the whole of humanity (and now our pets) have such a wide spectrum of experience of this moment, across a wide spectrum of choice. What does it all mean? And how do we look at it full-face so we can discern its meaning? Life/death, the ultimate mystery. It plays such mischief with our rationality. 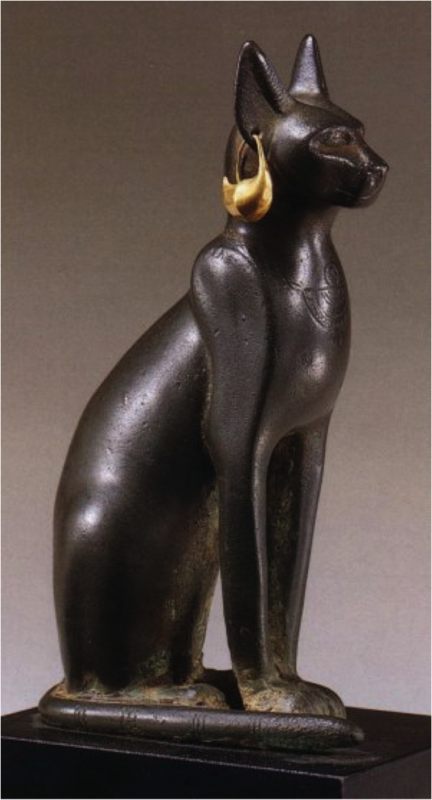 Bastet, Egyptian cat god, daughter of Ra (the sun god) and mother of Khonsu, god of the moon. She is the protector and avenger. Mischief is at peace now. She has crossed over and begins her journey to join her ancestors in the Egyptian pantheon of gods. Beautiful. And blessings to Mischief for her providing me with a rare opportunity to let fall tears in appreciation of Life. Even without our meeting, she entwines her beauty with my heart. So nice. Thank you, Jim. Yes, at peace, and crossed over to the arms of eternity. Nadia, this is so beautiful and profound. I am certain that your respect for the Mystery and acceptance of the Process allowed Mischief to release her spirit without fear or struggle. I’ll be keeping you in my thoughts and prayers. Big hugs. Thank,you so much, Julie. Your words soothe some of the hurt. I extend my sympathies for your loss, Nadia, and thank you for sharing this. You raise an interesting point about when or whether we should assist. Being ‘civilized’ implies we should choose quality of life, but having that capability does not make the choice an easy one. Farewell, Mischief. Thank you so much, Steve. And I agree about choosing quality of life, but I found that the answer of where the greater quality of life lay was not as obvious as I thought it was. Thank you for your kind thoughts. Mischief would appreciate them. Seventeen years of joy remembered. Yes she most definitely was a joyful cat. And committed to do her name justice. I weep for Mischief. The joy of life, the sadness of death, the eternal circle of life. Tears and laughter, the nectar and ambrosia of our existence.